There is nothing better than dark chocolate and sea salt, it is a combination made in heaven! Whist nibbling on salted crackers I started thinking how great it would be if I had a tub of dark chocolate spread. 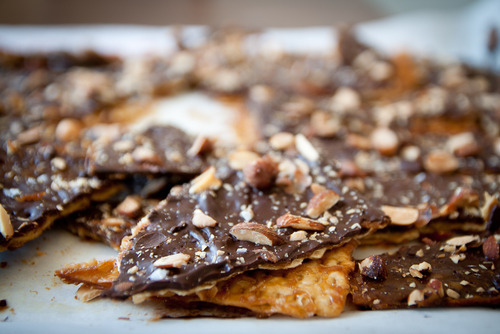 This got me thinking that dark chocolate salted cracker snacks would be a perfect combination! Dipping salted crackers into melted dark chocolate and sprinkling over with with the confectionery of choice and leaving to cool and harden sounds like a pretty good idea to me, and judging by the amount of hits on Google I’m not the only one who thinks this! A tin of these would also be a great personalised, affordable dinner party gift!